Join this seeker as he shares the pain and joys of this journey not of his choosing. Nancy, Dan’s wife, joins in sharing some of her thoughts, feelings as she watched her husband fight his battle. Dan writes openly and honestly of the struggles and joys of terminal illness. As he speaks freely of pain, joy and other emotions, you can see a window into the highs and lows of living with terminal illness. Take a look at this journey to see how love and faith have given us the hope to continue. Dan is genuine, transparent, challenging and faith grappling... He is honest about his wresting with cancer and living life to the fullest... These are not fairy tale musings but an intimate, personal invitation to walk in faith in a simple yet profound way. [Dan] writes with depth and perception from a traumatic life experience that none of us would covet. Dan is a storyteller as well and readers will be moved to laughter and tears as Dan regales us with stories and insights into what it means to be a Jesus follower during the trials of life. Hearing a diagnosis of cancer sets our world and the world of those we love, on edge. 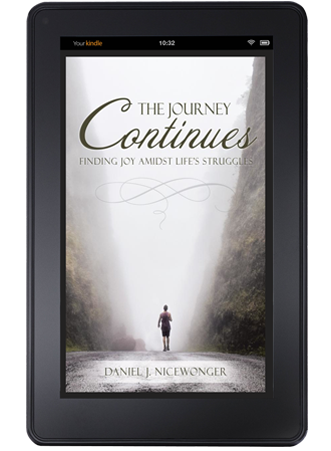 Many people endure in silence, but Pastor Dan Nicewonger has put words to that journey... I heartily encourage you to read this book and to share it with another who may be walking this same journey. Over the past three years I’ve witnessed Dan’s fight with cancer. I’ve been lifted by his courage, faith, honesty, and transparency... he is a capable leader. More than that, he’s a brother-in-Christ who is impacting others through his amazing journey. 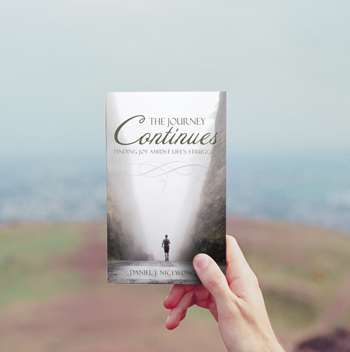 As Pastor Dan reveals his journey in this book we can learn much of the impact on he himself, his family, caregivers, and new-old acquaintances. Those who are surviving cancer will have many shared experiences but those who do not have cancer may gain great insight into the "new normal" and the "seasons" of change. Dan has been a seeker his entire life, seeking a deeper relationship with Abba Father. His journey was disrupted when the doctor said, “You have stage IV colon cancer.” Questions of “Why” and “If only” crowded his mind. Can one encounter God in the midst of a cancer journey? Dan has served as pastor for American Baptist churches in New York, Massachusetts, and Pennsylvania. His passion is to, “help people encounter God in the midst of their everyday lives.” He writes with a transparency intended to allow others to see the struggles that lead to healing and life. Dan currently serves as the Pastor of First Baptist Church of Kennett Square, PA.
Dan is available for speaking engagements and book signing events as his schedule permits. If you are interested in having Dan join your group to share of his journey and how God has met him in the midst of it please feel free to be in touch. One of the lessons Dan and Nancy have learned over the past two years is that a journey with long-term, or terminal illness is very difficult for the caregivers. Nancy shares some of her insight and thoughts from the journey within the book. If you are interested in having Nancy join you to talk about the role of caregiver she would welcome the opportunity. © The Journey Continues 2018. All rights reserved.